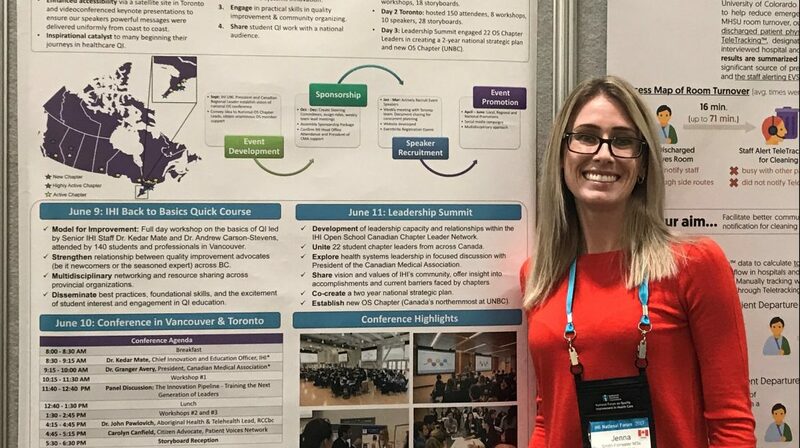 The Institute for Healthcare Improvement (IHI) Open School has just recognized UBC student Jenna Smith-Forrester as their 2018 Change Agent of the Year! The annual award celebrates one student’s demonstrated knowledge and application of improvement science, community organizing and leadership within their IHI Open School Chapter. Jenna was recognized as Change Agent of the Year at the IHI National Forum on Quality Improvement in Health Care in December in Orlando, Florida. Jenna, a fourth-year medical student at the UBC Northern Medical Program, has inspired many through her leadership in UBC’s IHI Open School Chapter and has helped to advance improvement education in UBC’s medical curriculum. We proudly support Open School Chapters at UBC, UBCO, UNBC, UVIC and SFU and provide an annual scholarship fund that supports exceptional students to attend educational events related to quality and safety. We’re thrilled to help leaders of tomorrow, like Jenna, make the most of their learning opportunities and become change agents. We recently had the pleasure of sitting down with Jenna to discuss her experience with the Open School and her improvement journey. Jenna first became interested in improving quality of care after a transformative volunteer medical trip in the Honduran highlands. Each day of the trip, the team would be given five cue cards: four to write meaningful, sincere compliments to their colleagues and one to make an improvement suggestion. Each evening the group would gather and review the cards, come up with a suggestion for the next day and implement that change. This activity made participants examine the system in which they worked, and recognize how small, incremental changes could have a dramatic impact over the course of a week. When Jenna returned from the trip, eager to learn more about improvement, she completed the online Open School courses and earned her Basic Certificate in Quality & Safety. Once she began her master’s degree at UBC, she got involved with their newly established Open School chapter. While at the time the chapter was still in its infancy, Jenna felt the potential and passion of the group. “We experimented with educational workshops of every shape and size, hosting them at every conceivable time,” says Jenna. “An early connection with the Council was incredibly influential in helping us achieve our success in hosting multiple events and creating training opportunities.” The chapter quickly grew in size, but the members saw the need to include quality improvement in formal education. Jenna’s passion led her to help integrate the Open School courses and Basic Certificate into UBC’s new medical curriculum, meaning that moving forward, every medical student will be introduced to quality improvement methodology and system-level thinking. While Jenna’s advocacy and leadership have played a tremendous role in advancing quality improvement education, she cites the support of the IHI Open School community as an integral motivator for her work. “It’s one of the most supportive communities I’ve ever had the pleasure or privilege to be a part of. It’s hopeful, and I think in some areas of medicine that’s more important than anything else. You feel people are very aware of the challenge that’s being faced, but they don’t let that deter them. It’s been exciting to be a part of a community that offers hope.” She notes that BC’s community is particularly special and tight-knit, intertwining the Open School, the Council and other organizations doing similar work. Jenna encourages students in other communities to get involved and embrace improvement in their careers and education – even if they’re feeling a time and resource crunch. Online coursework for the Open School is delivered through a versatile app and broken down into lessons as brief as 15 minutes.